Ontario's Muskoka region has been for many years a playground of the wealthy, the "Hamptons of the North." 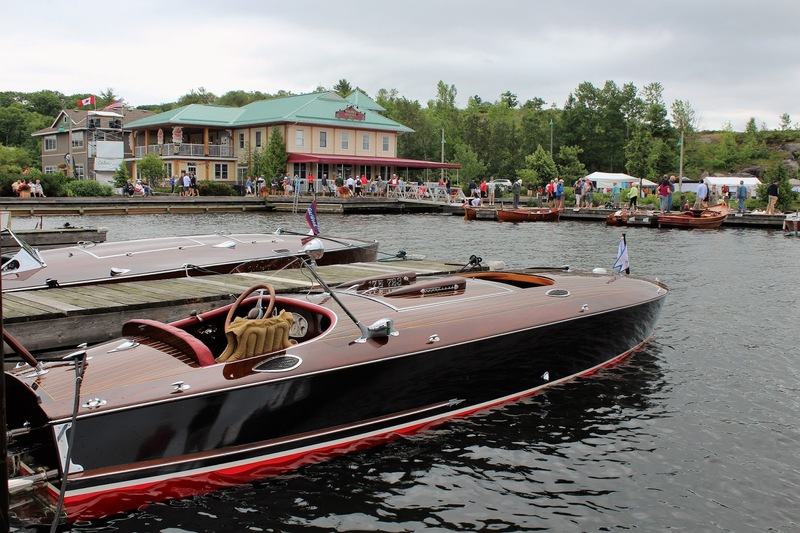 Lake Rosseau's "Millionaires' Row" is outdone only by Lake Joseph's "Billionaires Row." 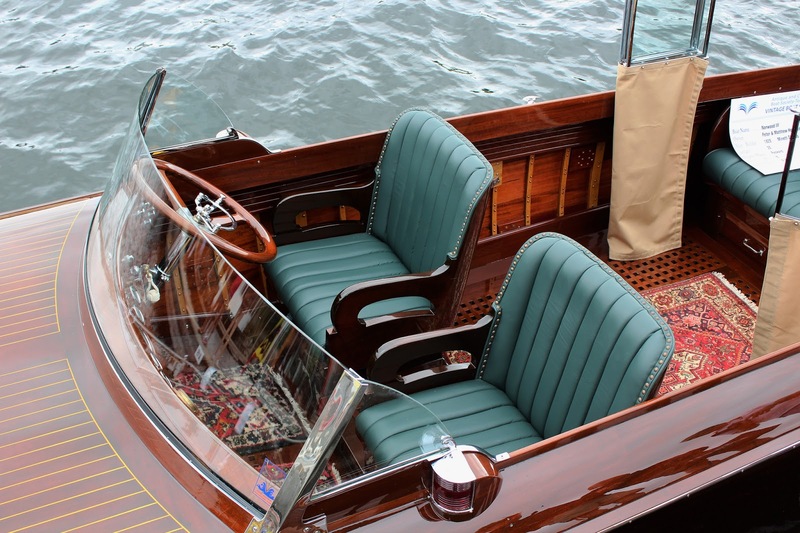 Among noted property owners were US President Woodrow Wilson, as well as Hollywood figures of today including director Steven Spielberg. 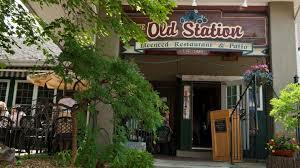 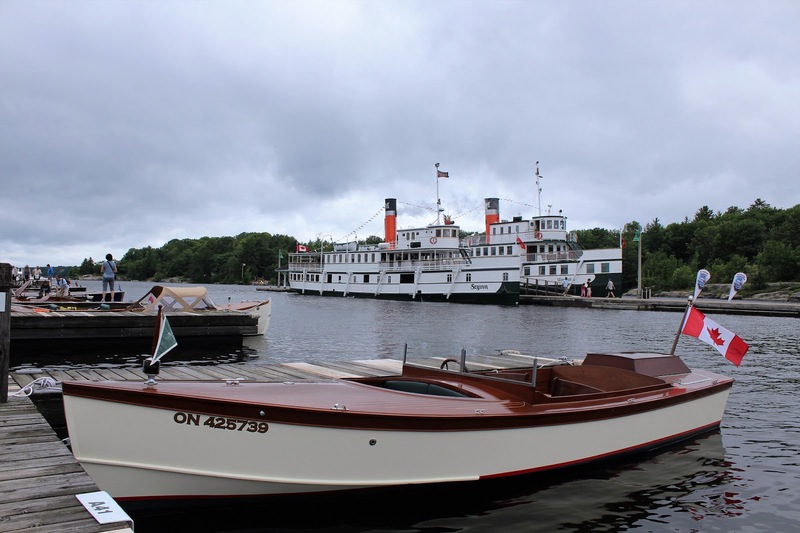 The area's popularity began with start of steamboat services in the 1860s and 1870s, followed by the railroad's reaching Gravenhurst in 1875. 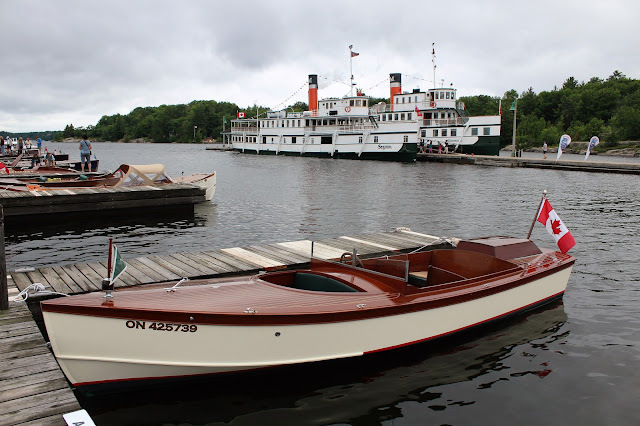 Several grand hotels were constructed, some of which have survived. 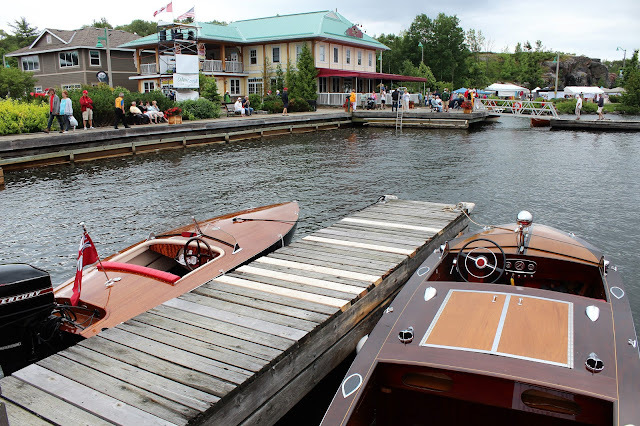 From simple cottages private accommodation became grander, with elaborate matching boathouses. 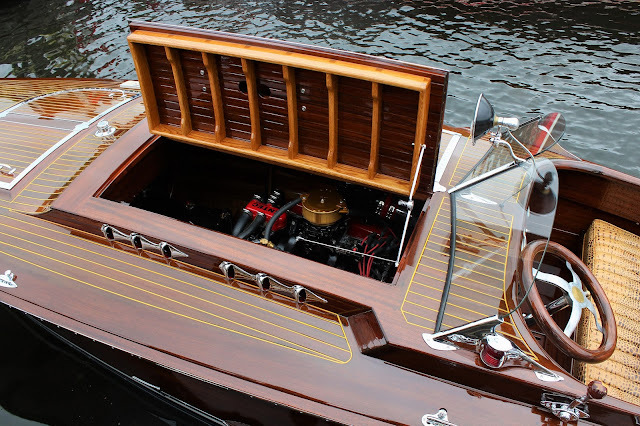 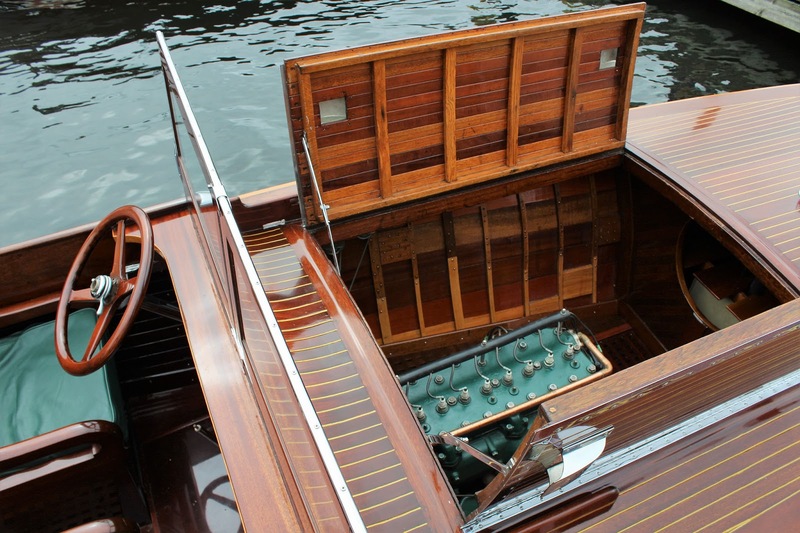 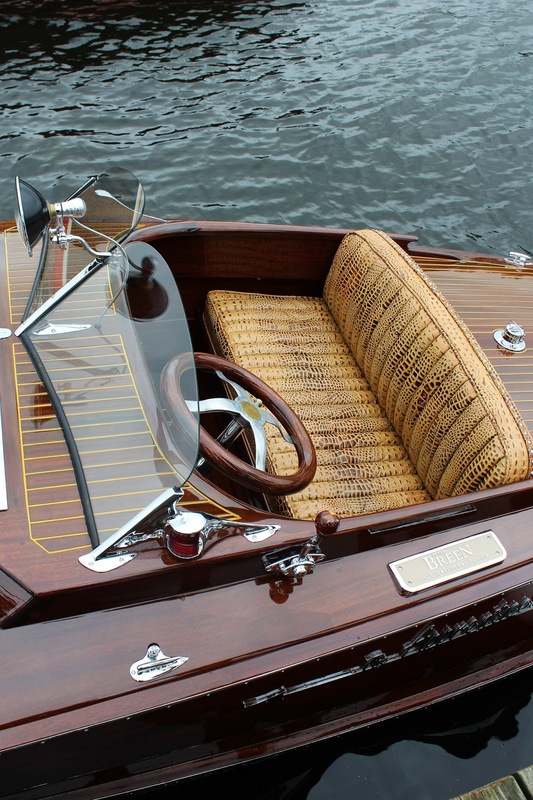 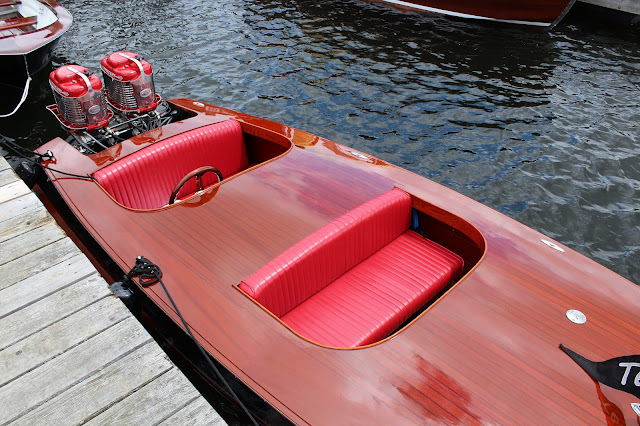 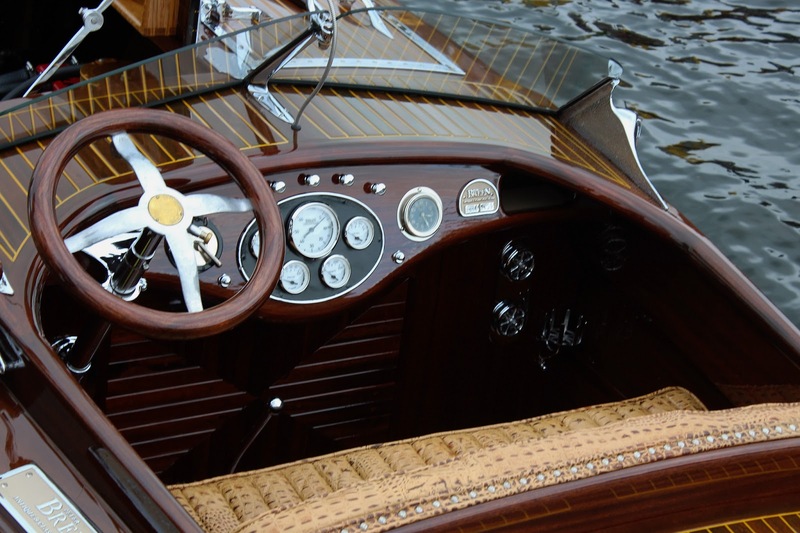 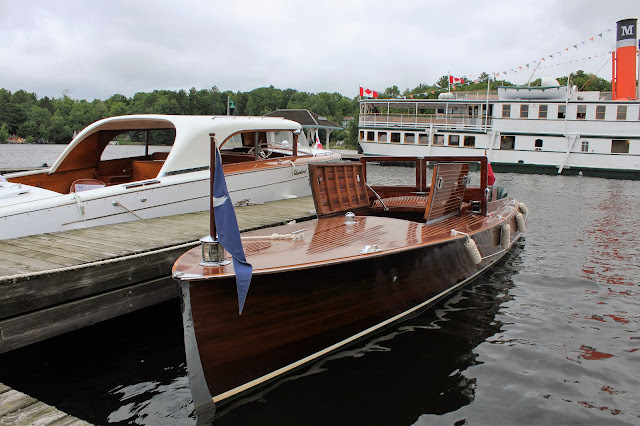 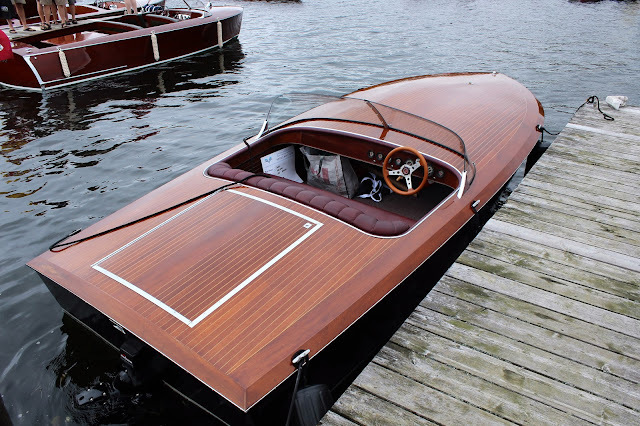 And in those boathouses were often to be found the gorgeous Muskoka wooden speedboats, as much a mark of success as their contemporary Packard and Pierce-Arrow motorcars. 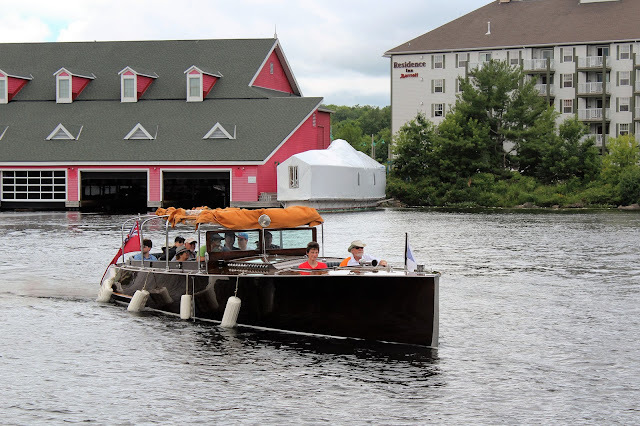 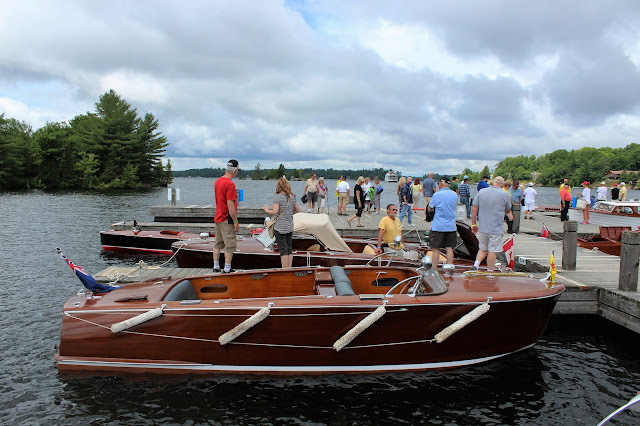 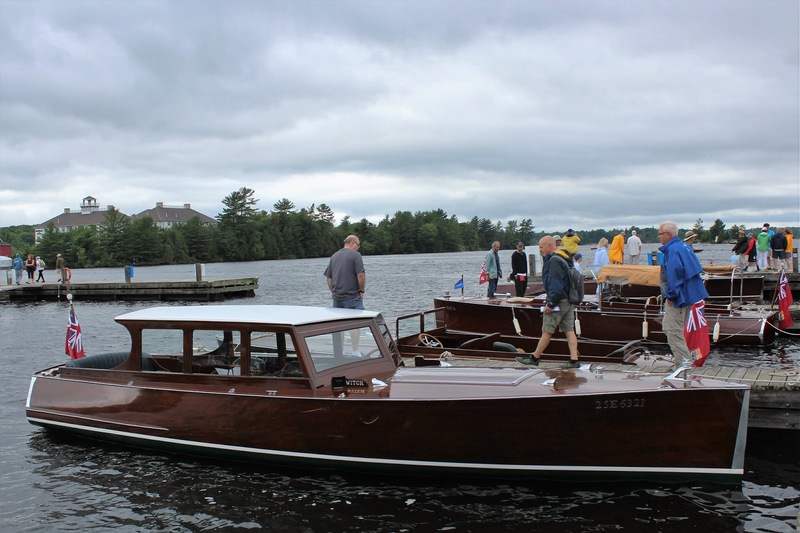 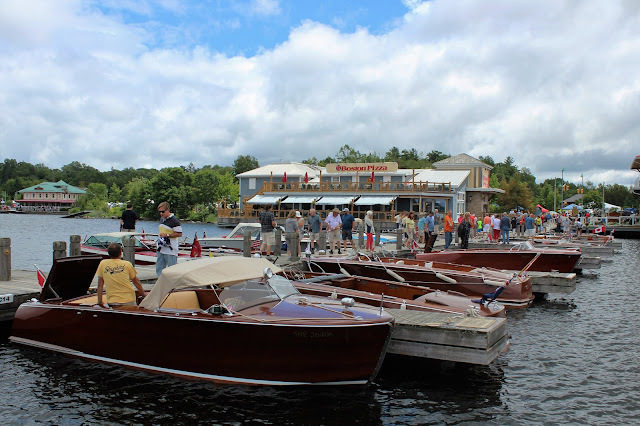 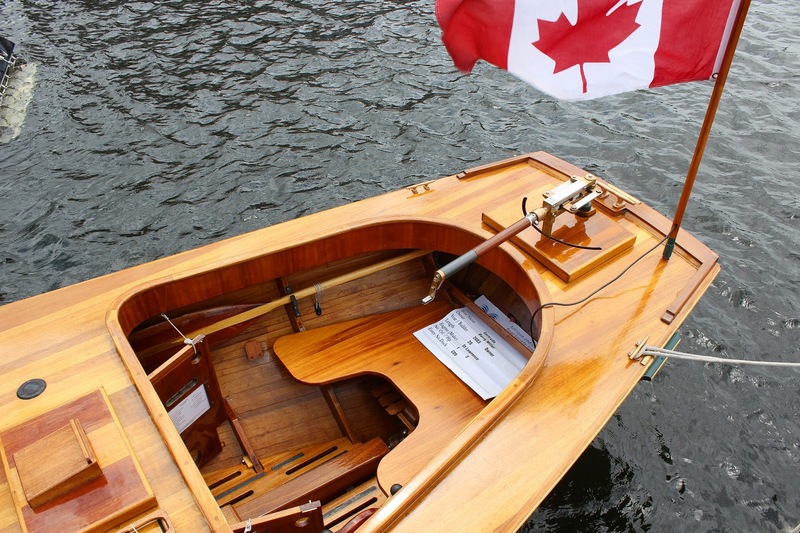 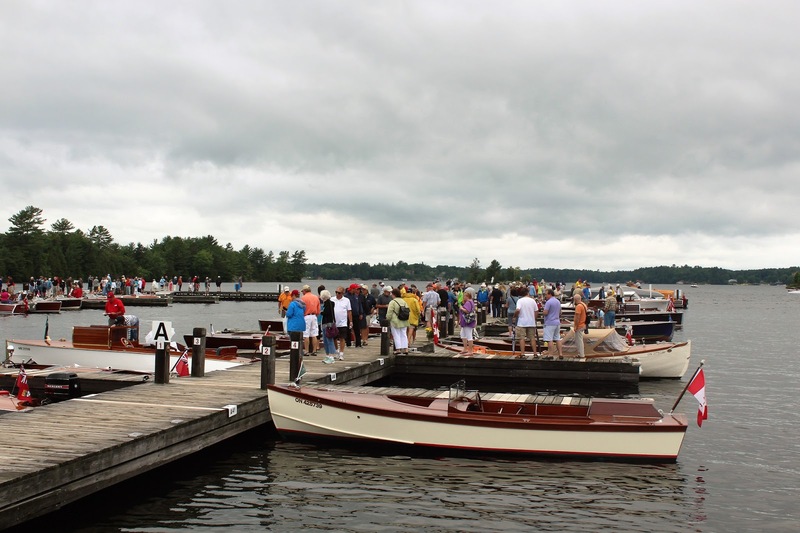 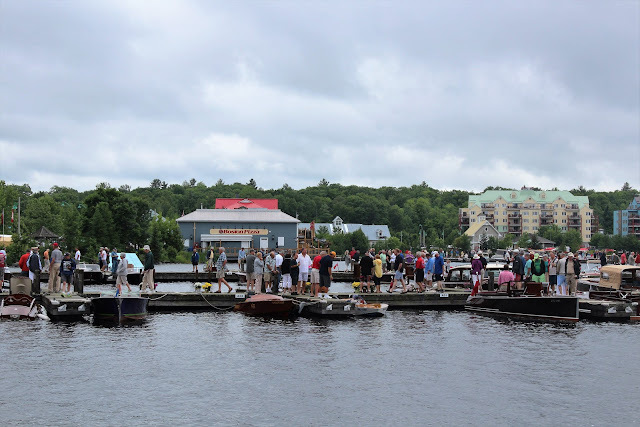 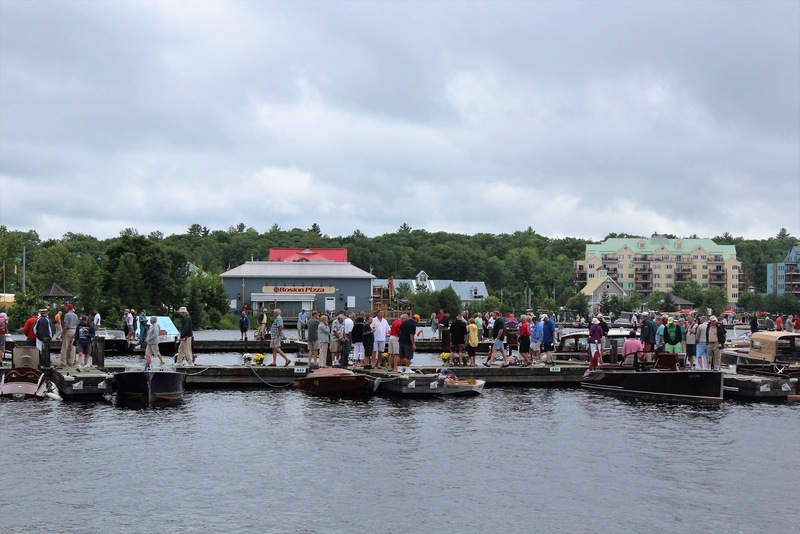 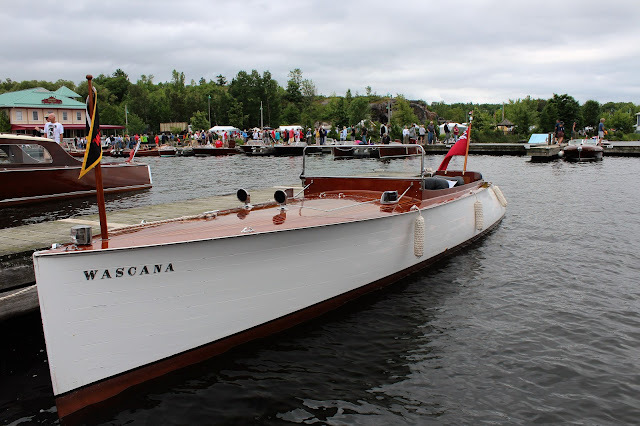 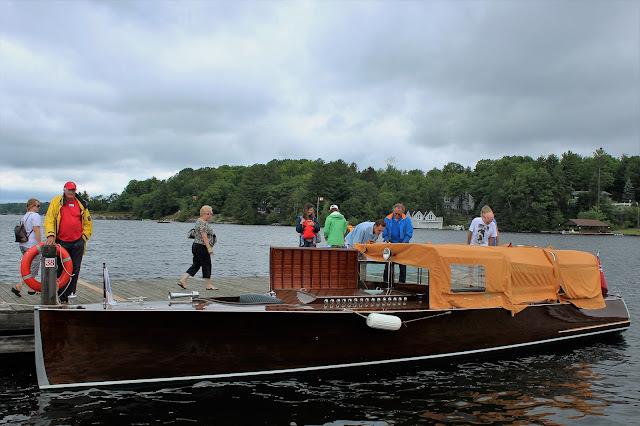 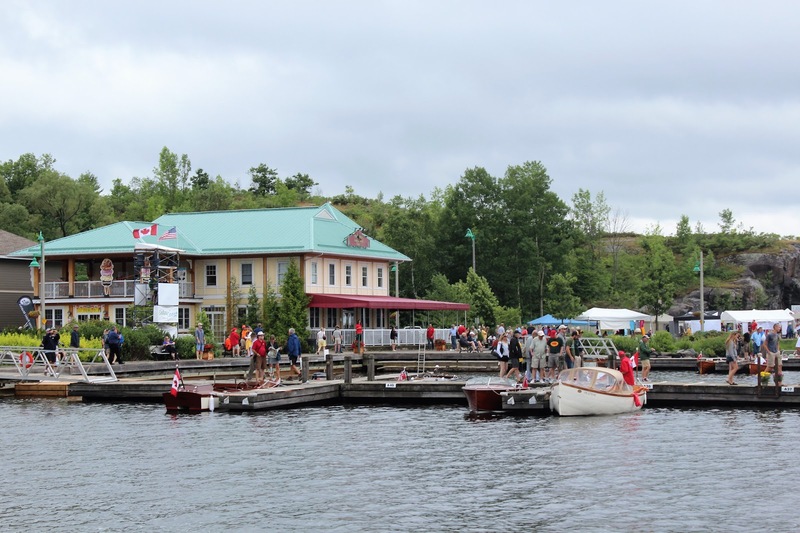 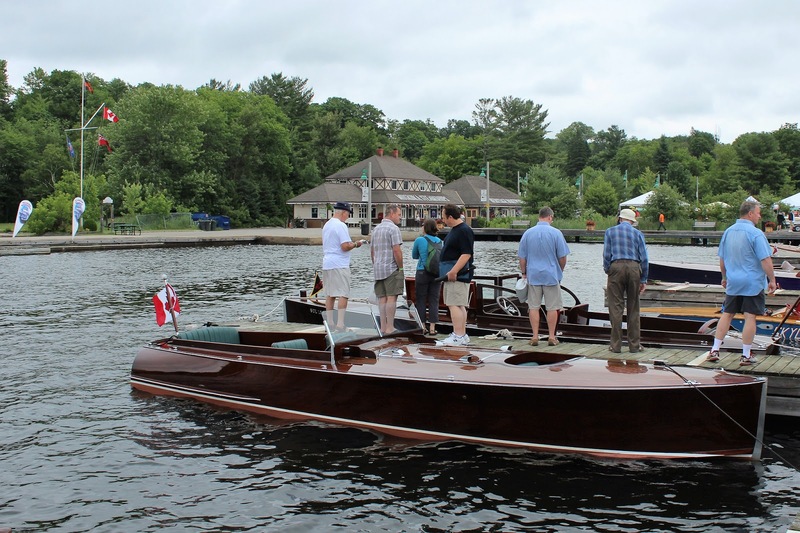 Each year the Muskoka Wharf in Gravenhurst is the scene of the annual Summer Vintage Boat Show, hosted by the Antique and Classic Boat Society (ACBS) of Toronto. 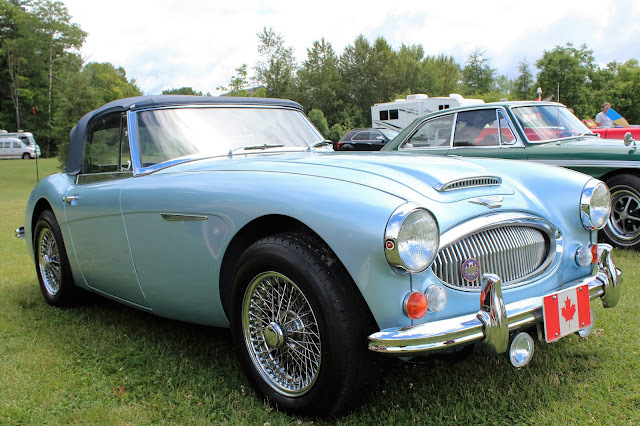 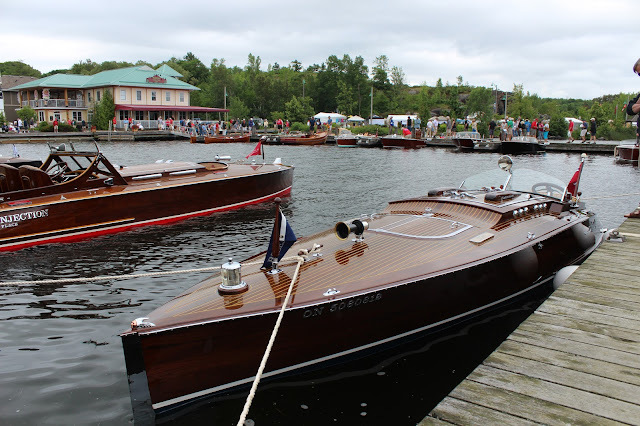 Having enjoyed Concours d'Elegance in various venues, we thought it would be worthwhile to attend the nautical version of a transportation beauty show in 2016. 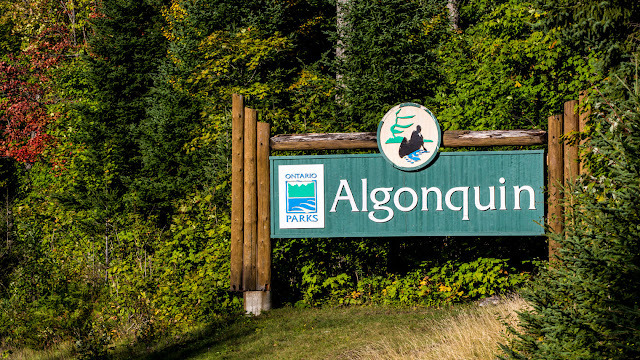 On July 8 we left Ottawa in the Corvette for Bracebridge, a drive of around 5 hours that took us through Eganville, Madawaska and Barry's Bay before reaching Algonquin Park and then heading south from Huntsville to Bracebridge, where we found our pre-booked B&B. Bracebridge (population 16,000) has limited accommodation, particularly in the high season we were in but we were very comfortable and had an excellent dinner in a small restaurant converted from a service station on the main street. 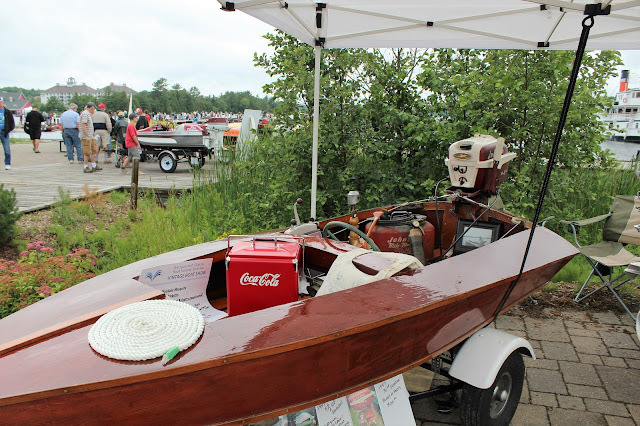 Of course, we also enjoyed some local craft beer there as well. 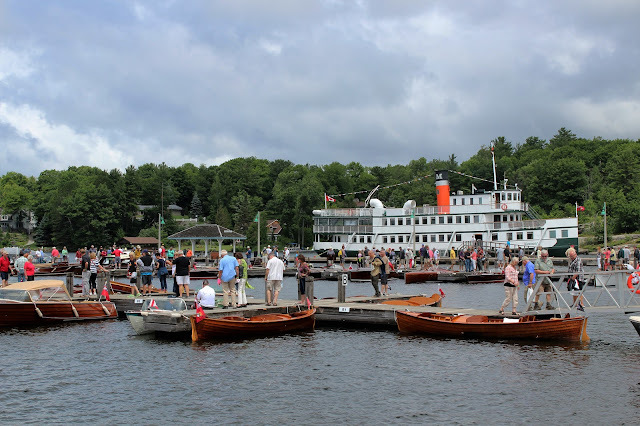 The next morning a 15 minute drive brought us to the Muskoka Wharf in Gravenhurst. 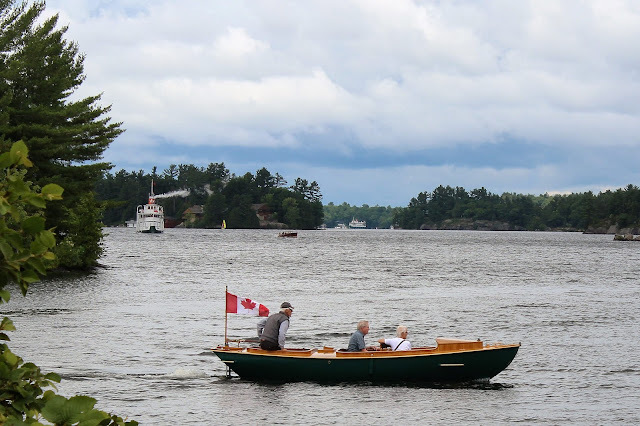 The weather was poor, being overcast with a light drizzle. 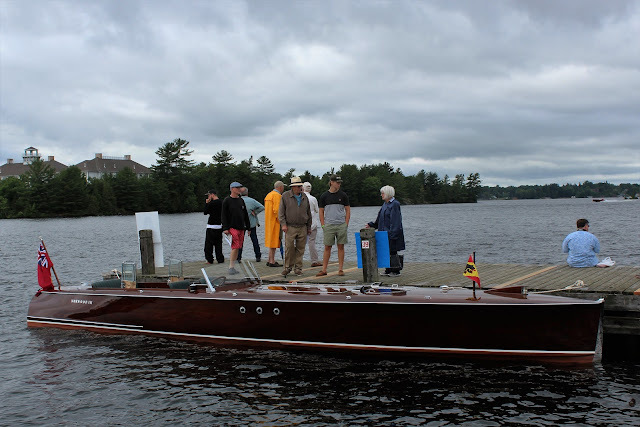 A shuttle bus took us from the parking lot to the wharf itself and we soon found ourselves immersed in the world of the Muskoka Wood Boat as the rain stopped. 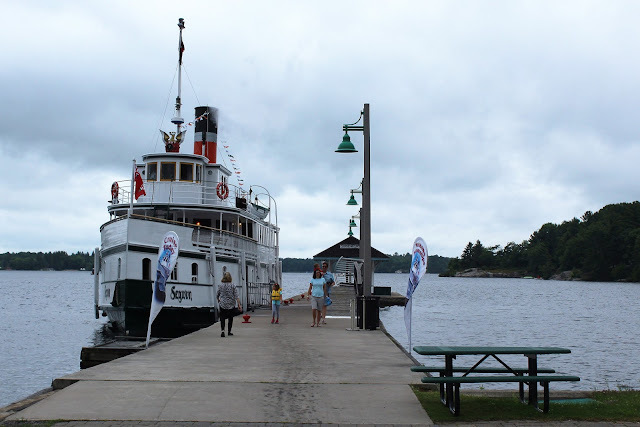 Our first sight was the impressive RMS Segwun, a steamboat launched in 1886 and used on Muskoka service until 1956. One of only four ships to carry the Royal Mail Ship designation now, it was a floating museum for many years before a 12 year restoration project saw it return to service in 1981. It is owned and operated by the Muskoka Steamships and Discovery Centre, a charitable organization, and will be the subject of a separate post here. 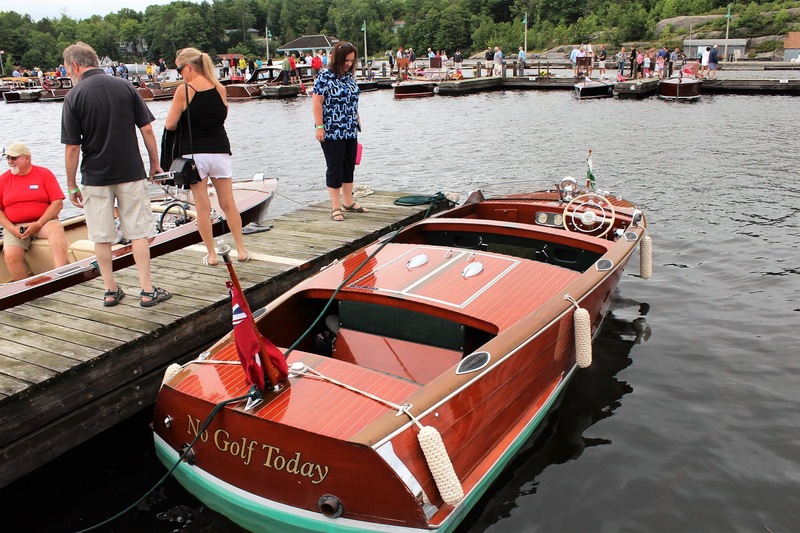 The boat show was pretty simple in its organization. 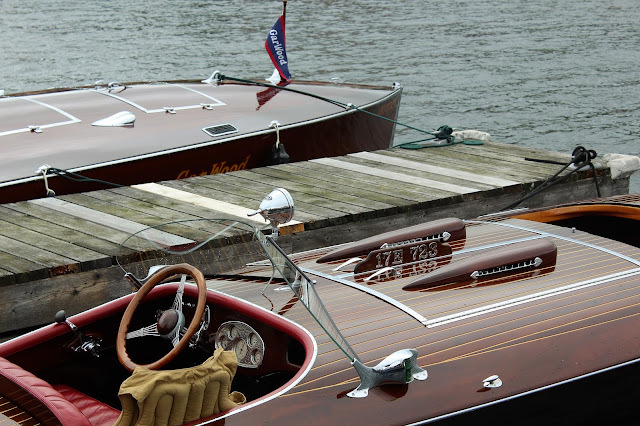 The docks had been cleared of more prosaic craft and show boats moored, so it was a matter of walking along the docks and admiring them, while keeping your balance. 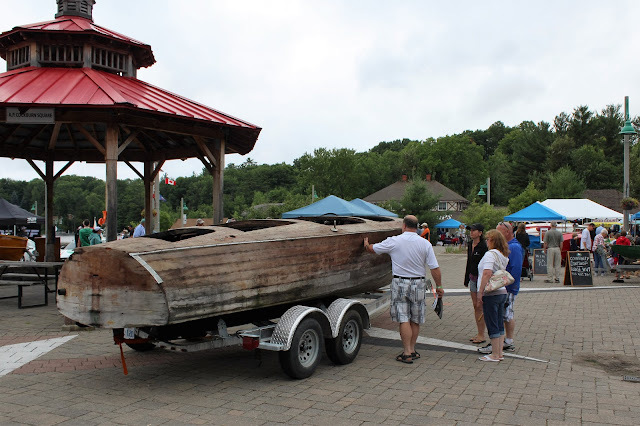 There was an area on dry land with some exhibitors close to the docks but also further along the shore. 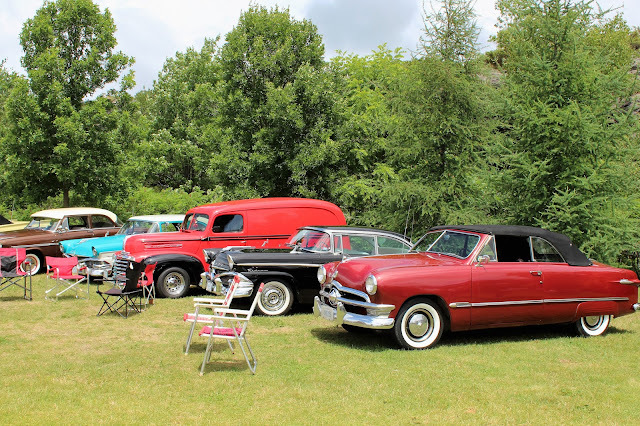 In addition, there was a small vintage car show as well, which was particularly active thanks to a half-dozen Amphicars on the move. 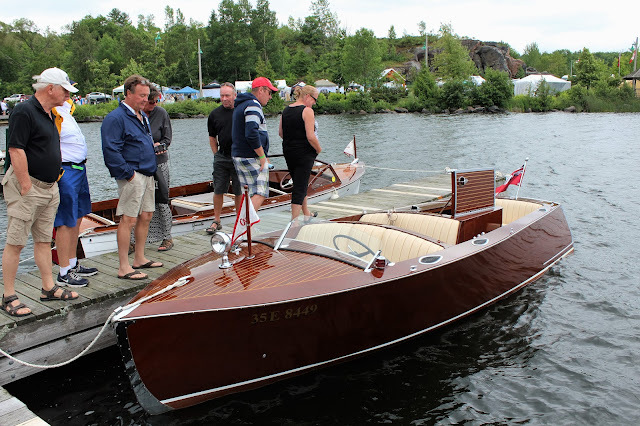 Small speedboat under construction. 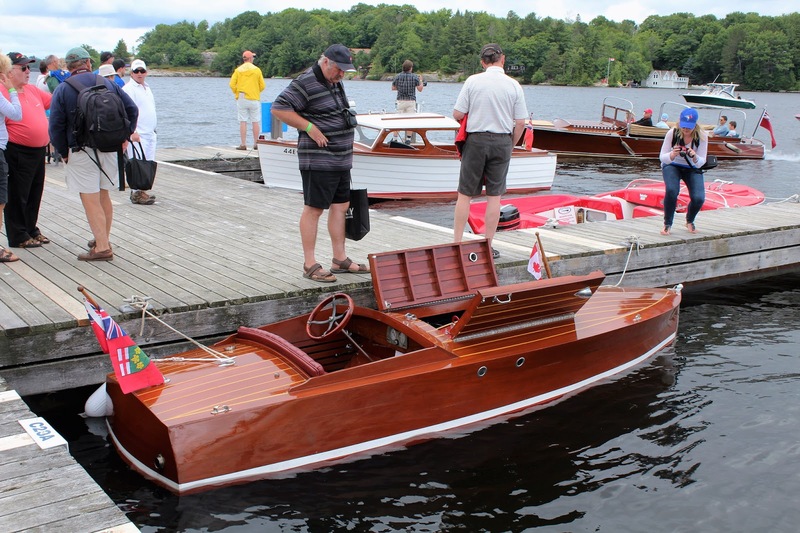 The Muskoka Seaflea was a type of very small boat powered by an outboard engine, inspired by hydroplanes and quite fast. 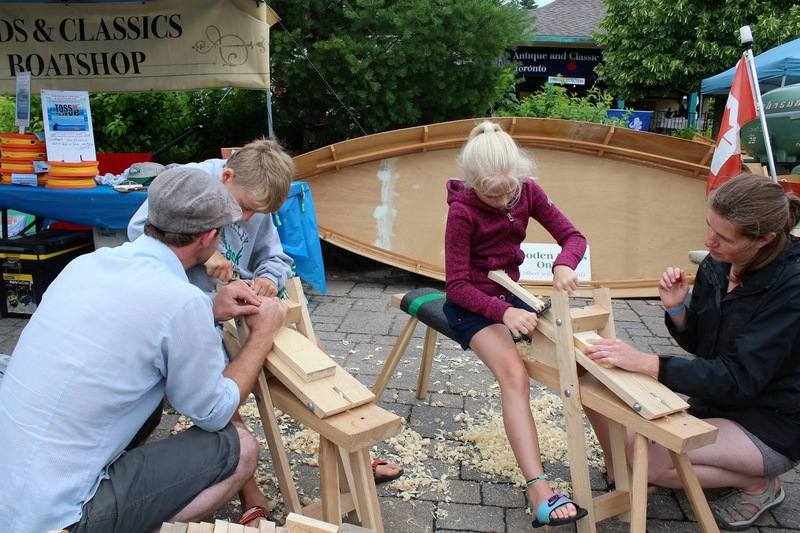 Seaflea competitions were popular in the 1970s and the ACBS wants to encourage children to participate in wooden boat building and offered some instruction at the show. 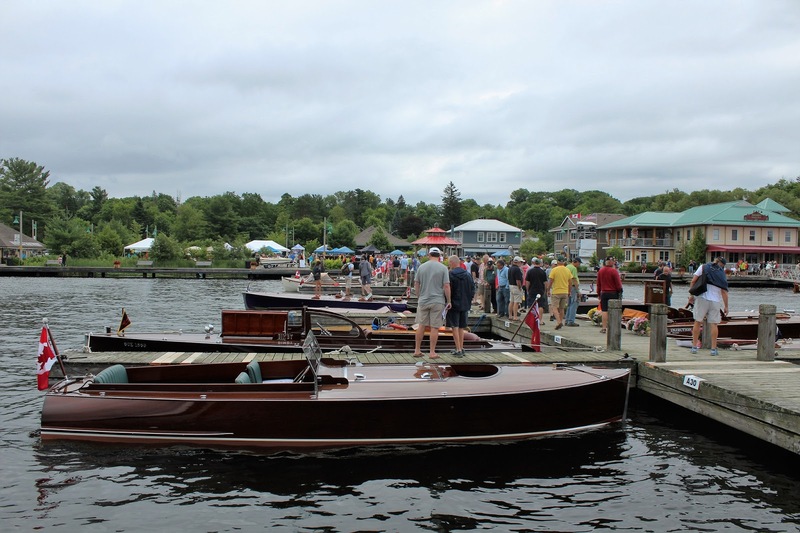 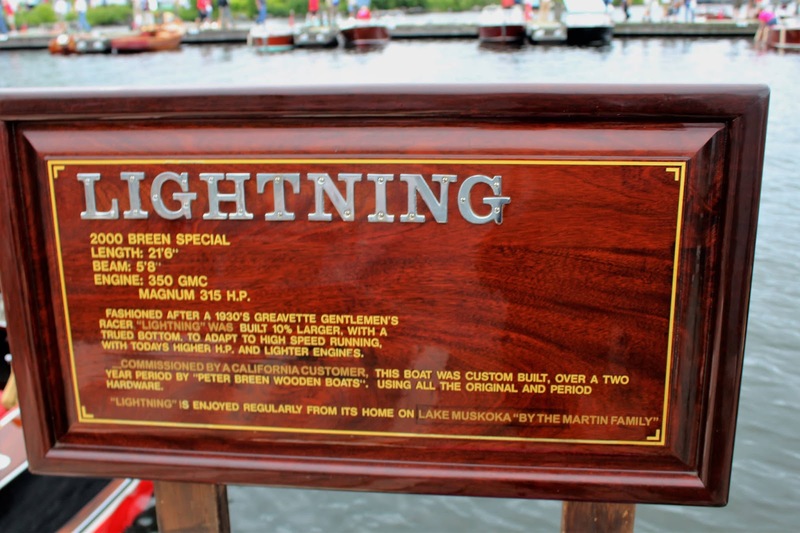 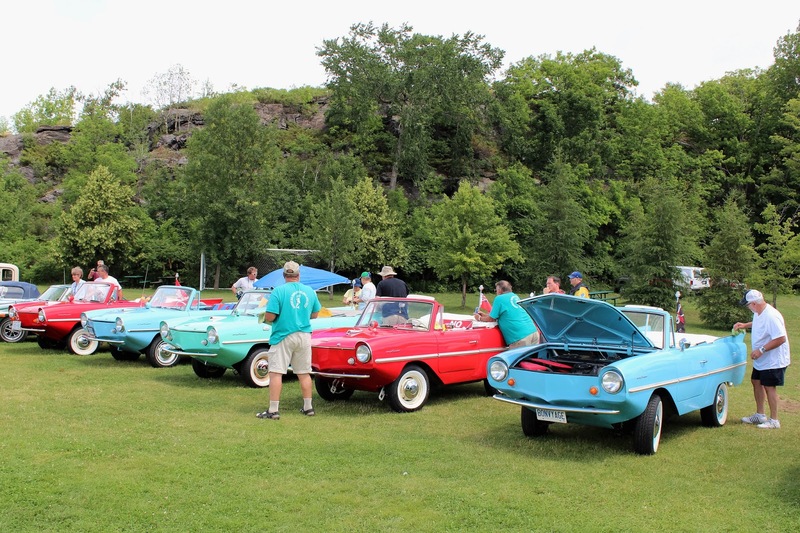 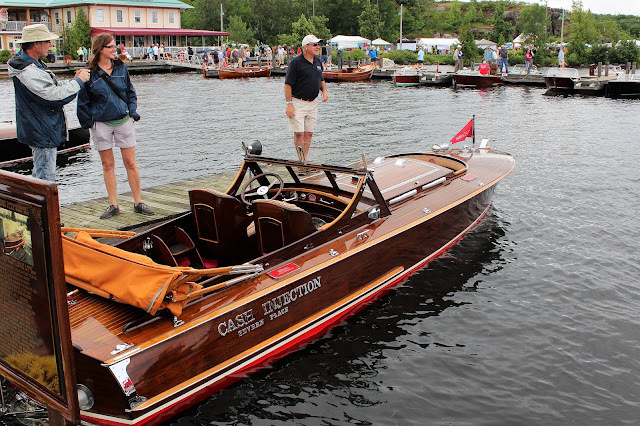 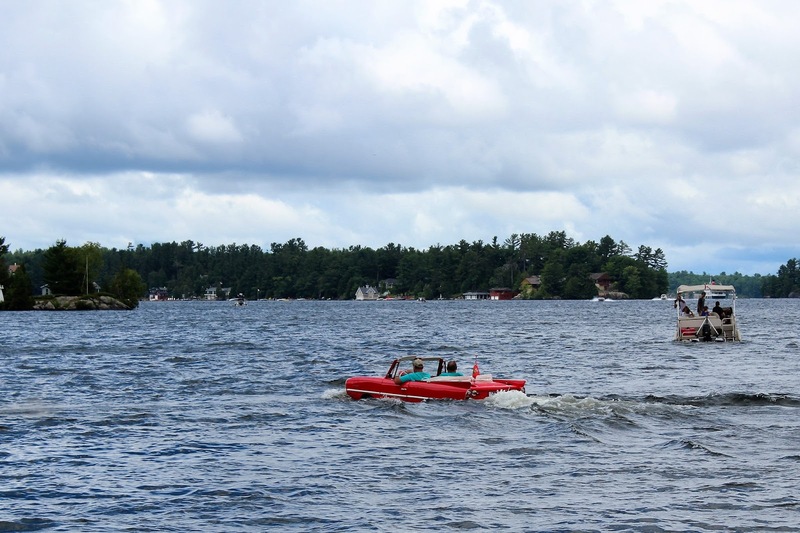 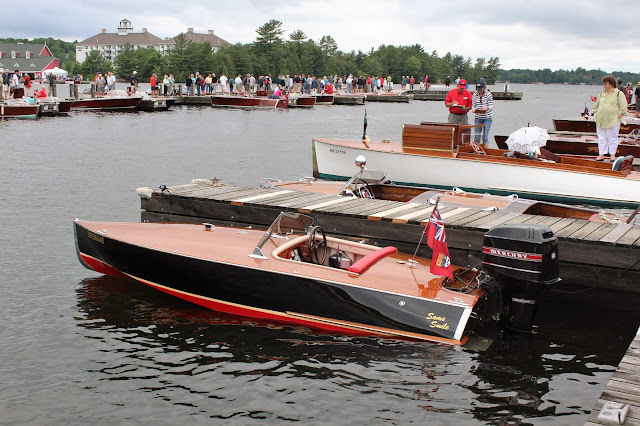 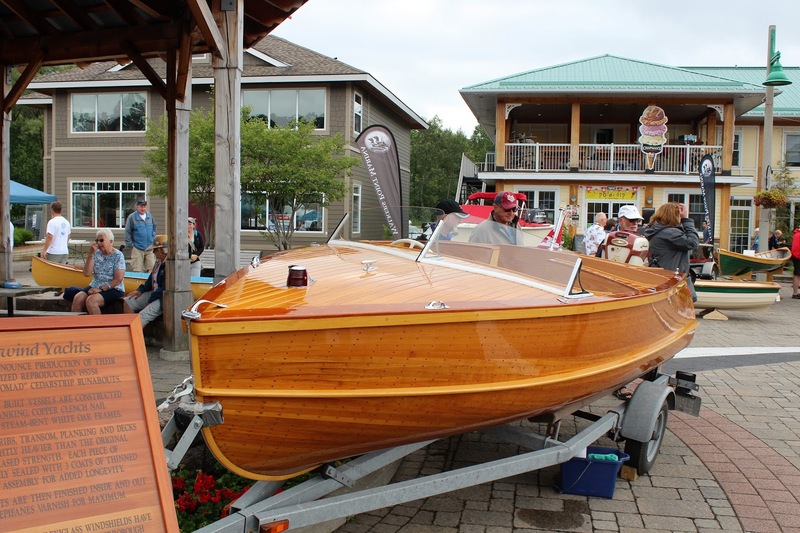 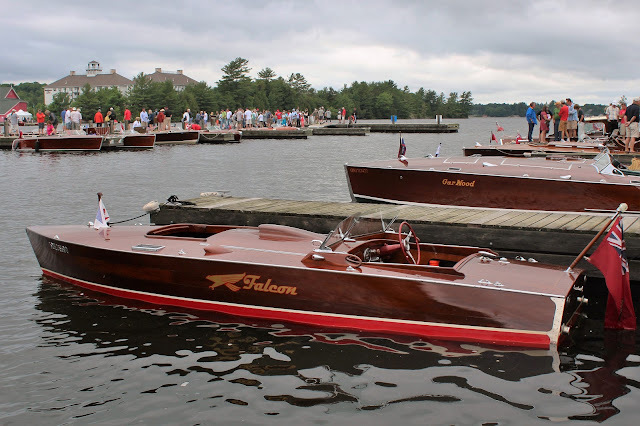 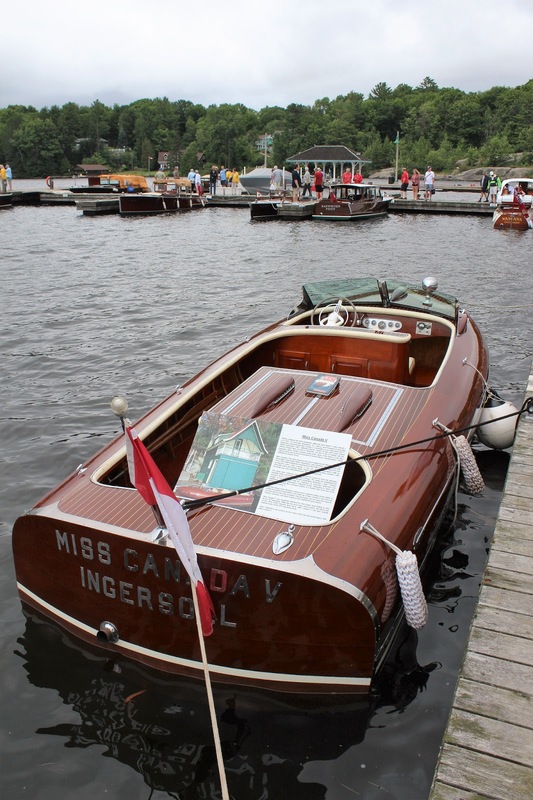 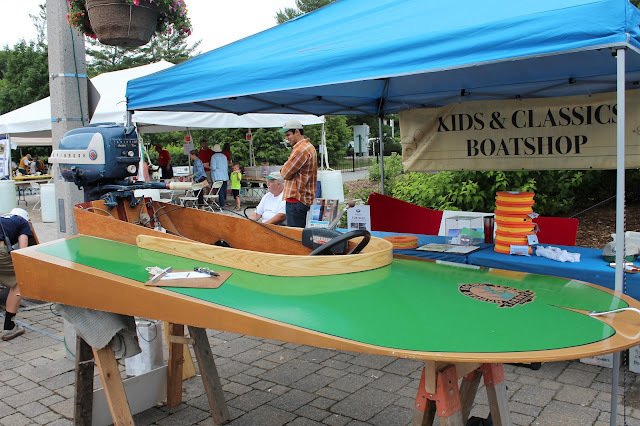 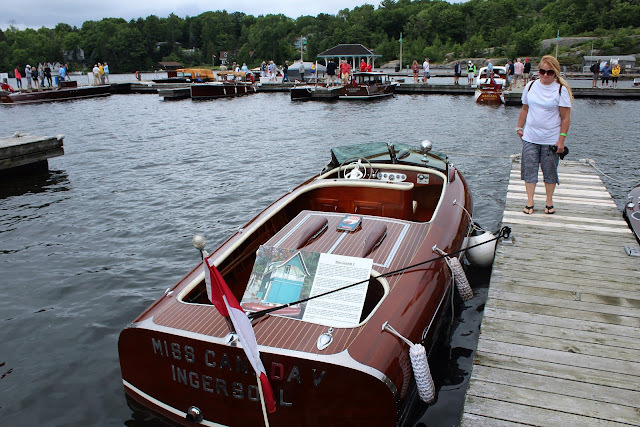 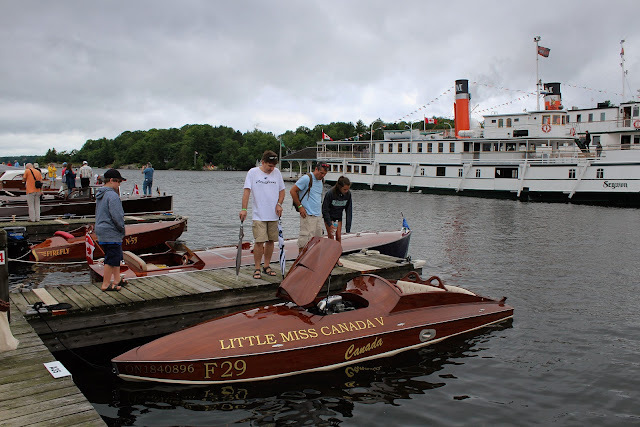 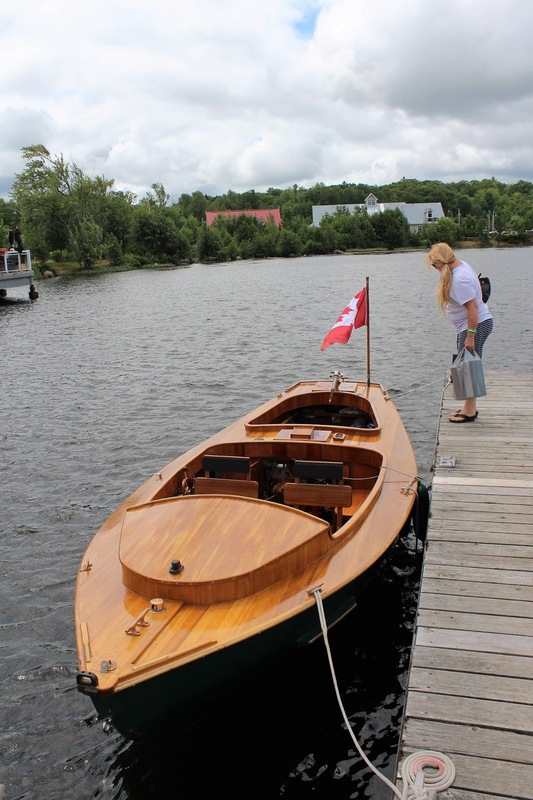 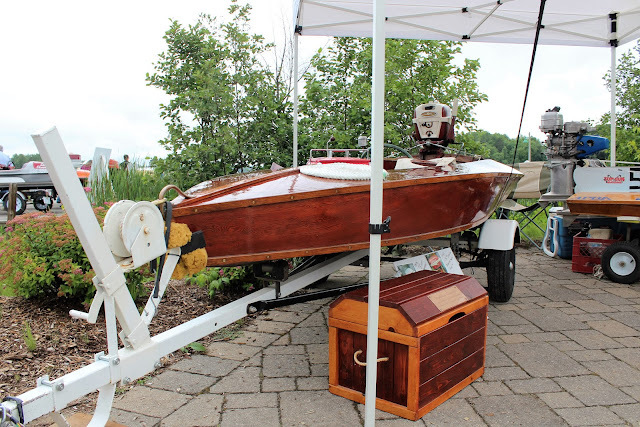 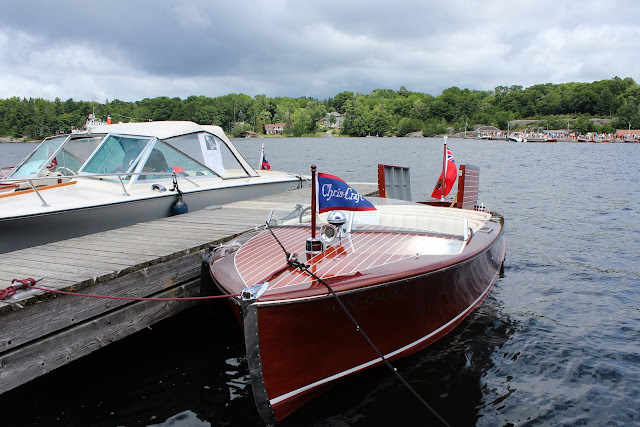 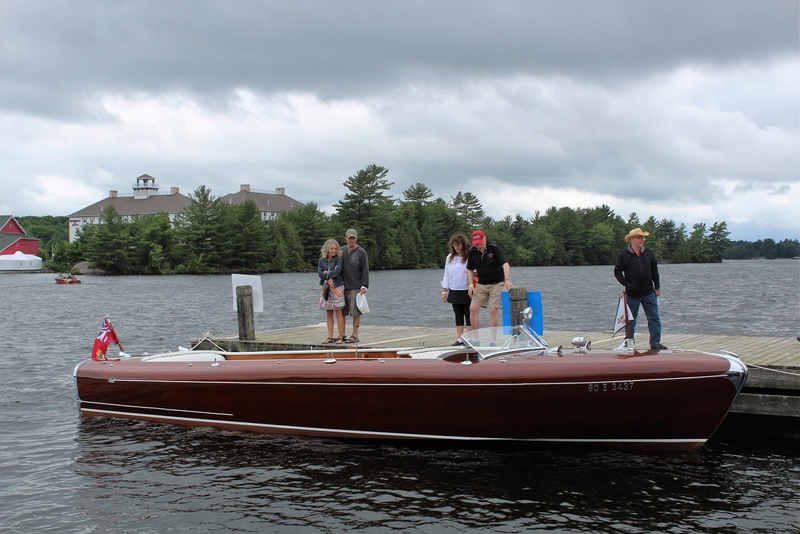 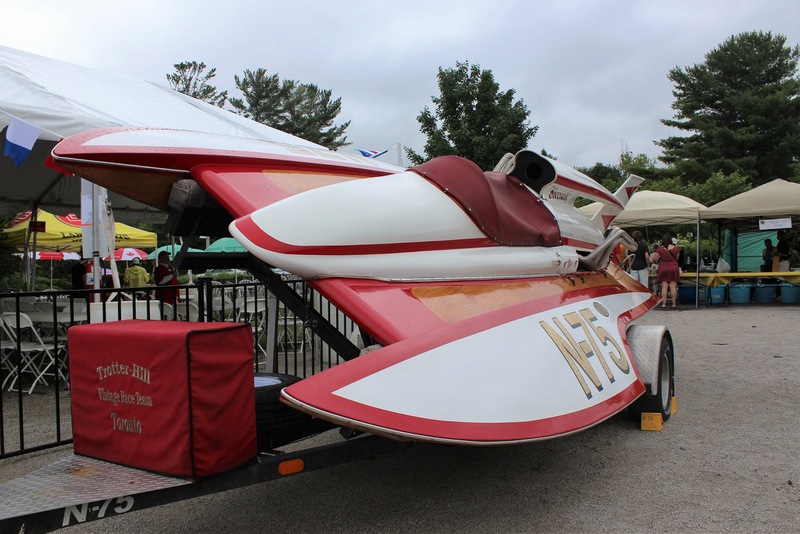 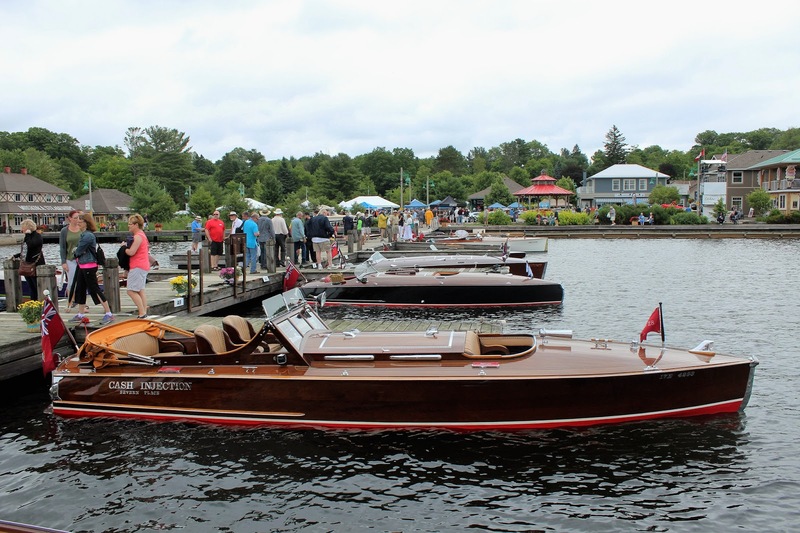 The show featured both vintage speedboats from celebrated yards such as Ditchburn and Greavette in Gravenhurst and Minett in Bracebridge, but also a number of recent builds. 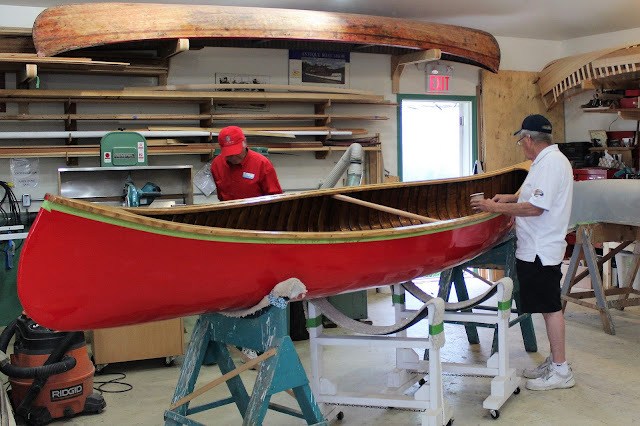 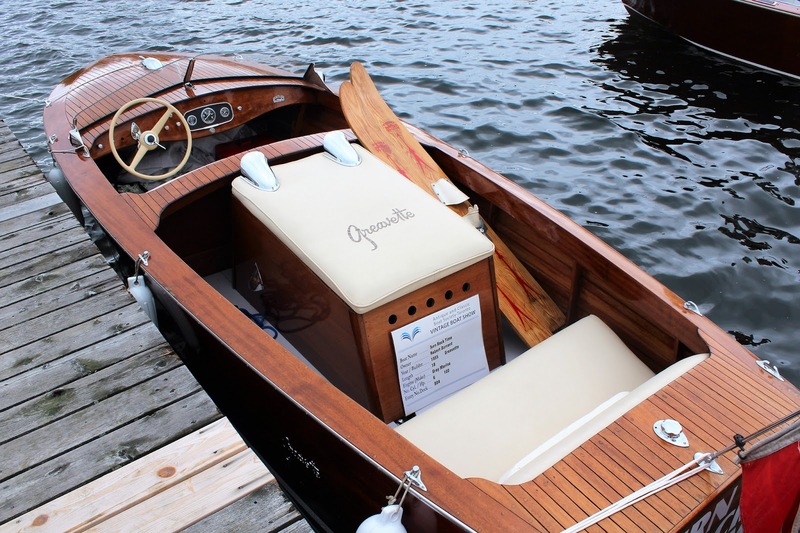 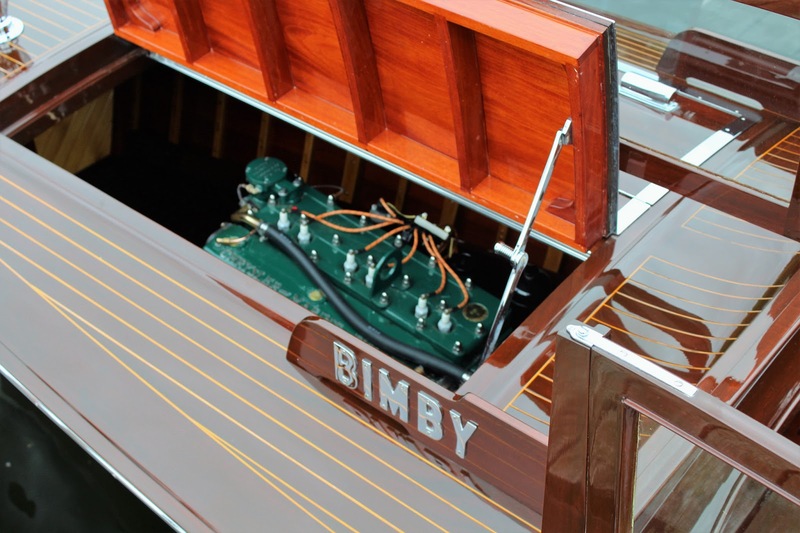 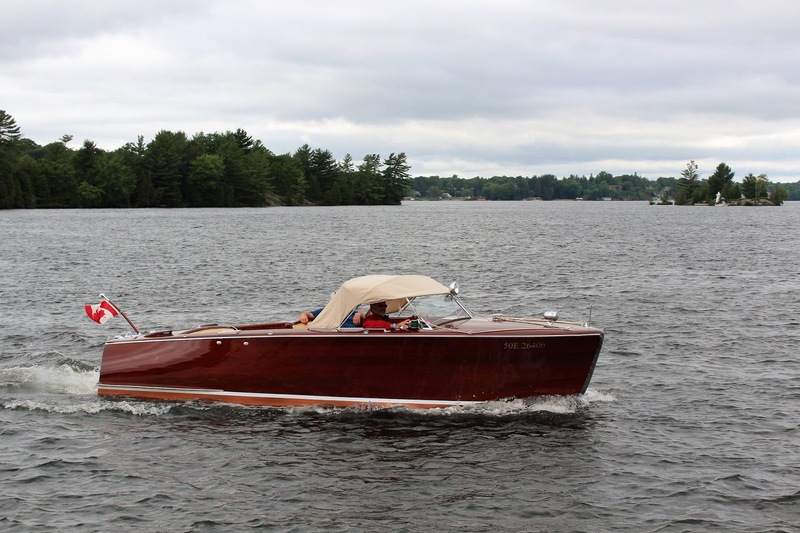 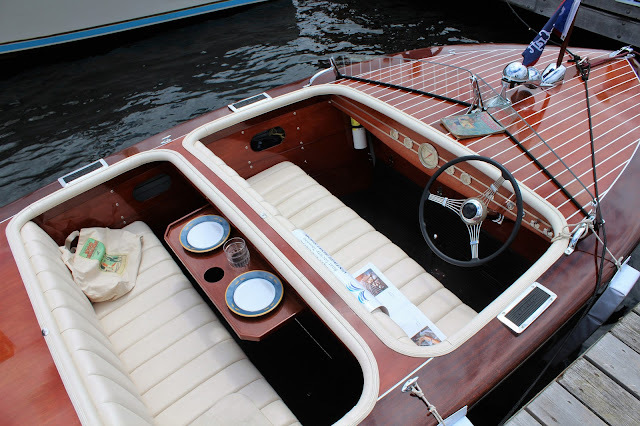 There are perhaps a dozen boatbuilders in Ontario still offering to produce a classic Muskoka speedboat with the kind of hand craftsmanship of the past but with lighter and more powerful engines. Of course, if you have to ask how much you can't afford it! 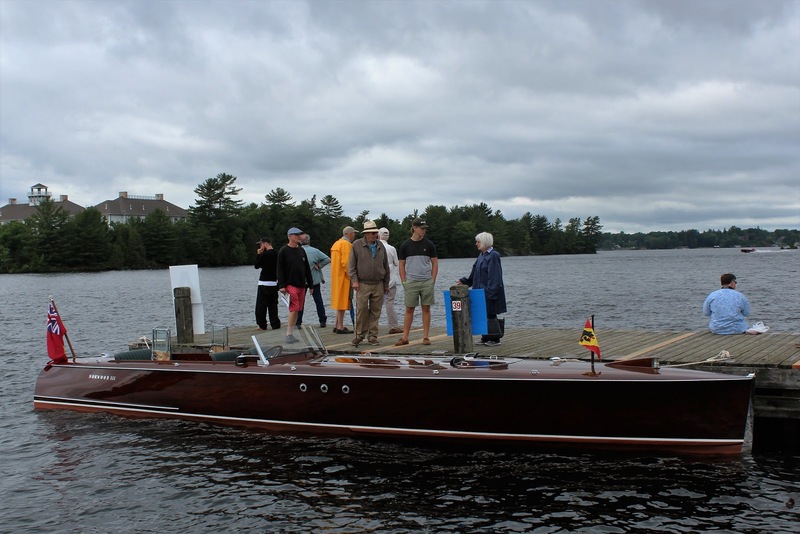 Built in the Peter Breen yards between 2013 and 2016, "The Apprenticeship" is a copy of a 1923 design, a Hacker Rainbow III. 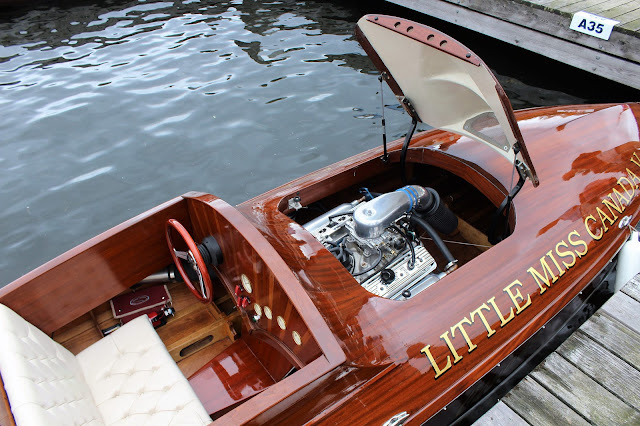 The modern version features a modified Chevrolet small block engine, putting out 340 hp compared to the original's 200 hp. 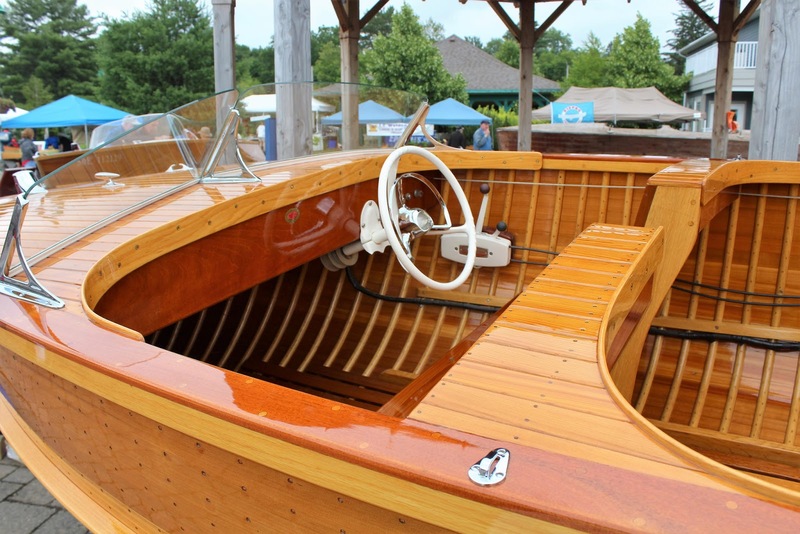 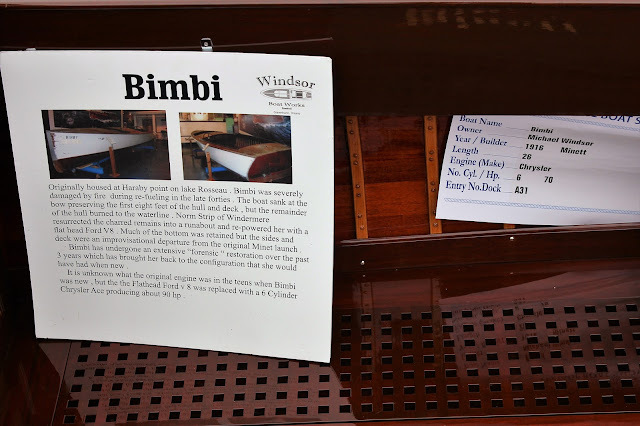 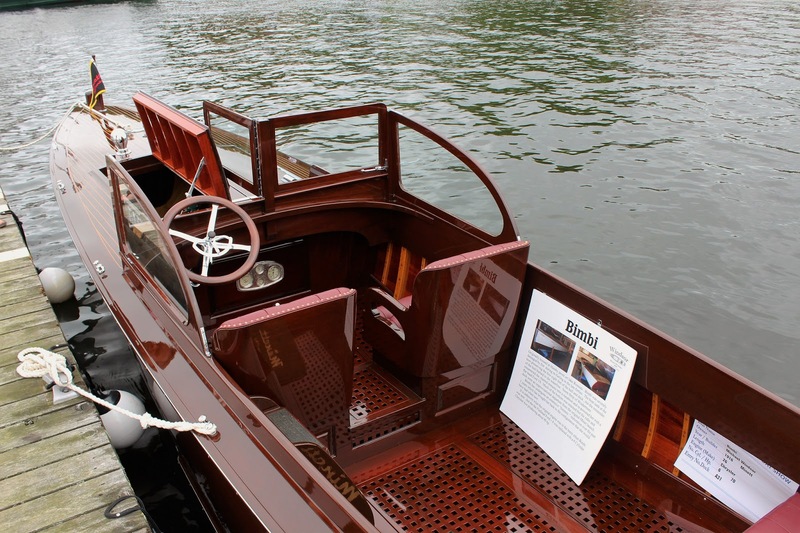 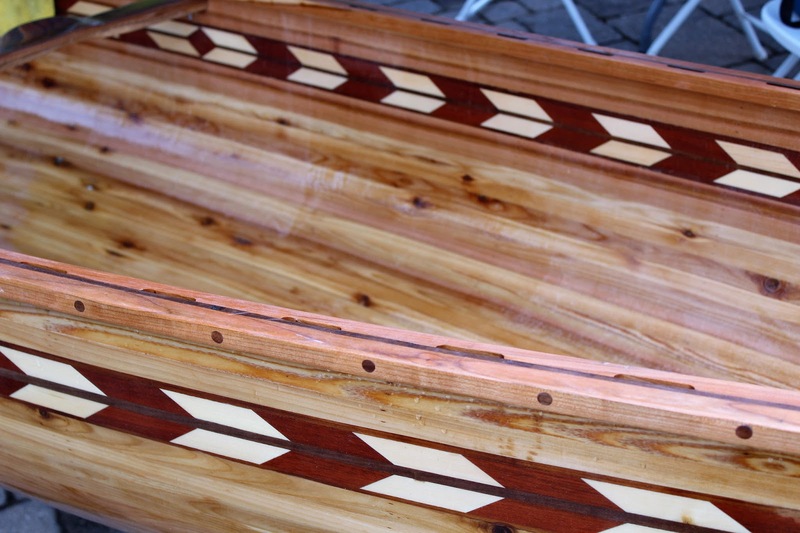 The boat was made using a white oak framework and a solid mahogany skin, with no veneers used at all in construction. 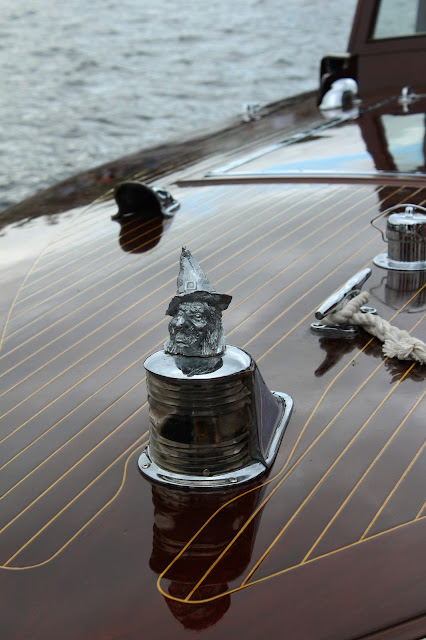 Castings are solid bronze, chrome-plated. The boat is used as a sales tool to indicated to customers what the Breen yard can do. 1991 Clarion Gold Cup boat "Riot"
"Cash Injection" is a Peter Breen replica of a 1930s Ditchburn boat and was completed in 2003. 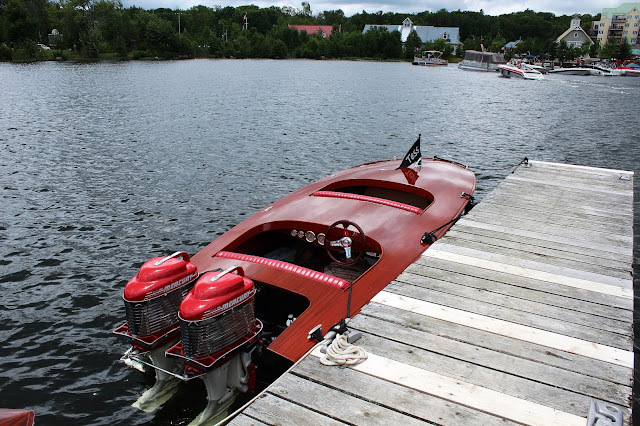 It has 500 hp! 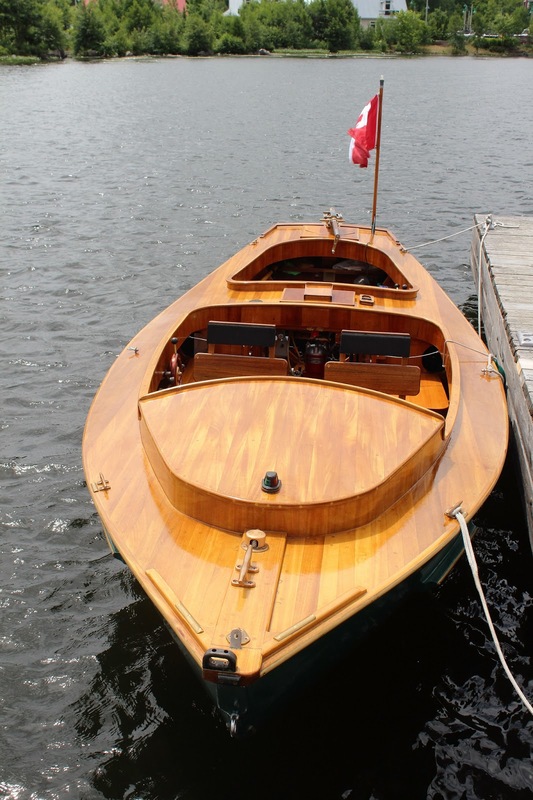 Along with the mega-powerful speedboats, we came across the charming "Gertrude," a replica of a c. 1900s fishing boat known as the Swampscott Dory once used in the Atlantic fishery north of Boston. 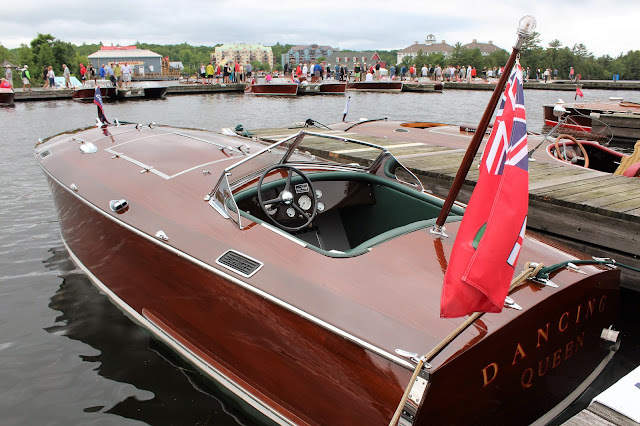 The replica was built in 2002 and features a period 1 cylinder 3 hp two-stroke gasoline motor, which has no clutch or reverse gear but is directly connected to the propeller. "Gertrude" features a unique "Kitchen Rudder," which uses clamshells around the propeller, furnishing reverse and neutral as well as excellent maneuverability. 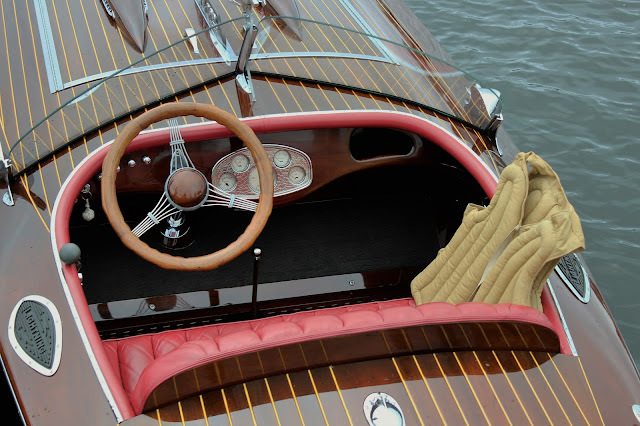 Top speed of the boat is 5 knots. 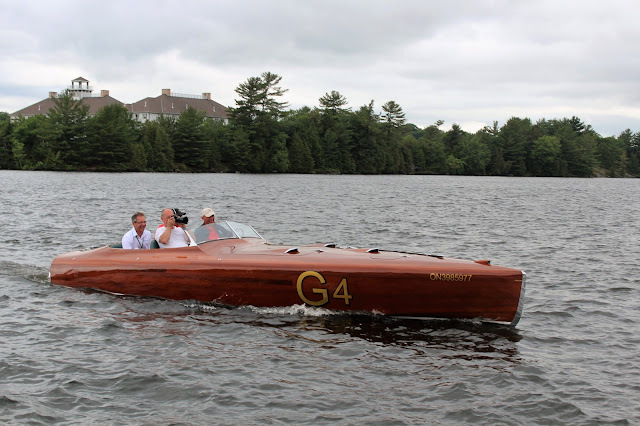 Luckily the Corvette does not have a trailer hitch--otherwise how could I have passed up the lovely little Tom Cat hydroplane (65 hp) for $5500, including a custom trailer and cover? 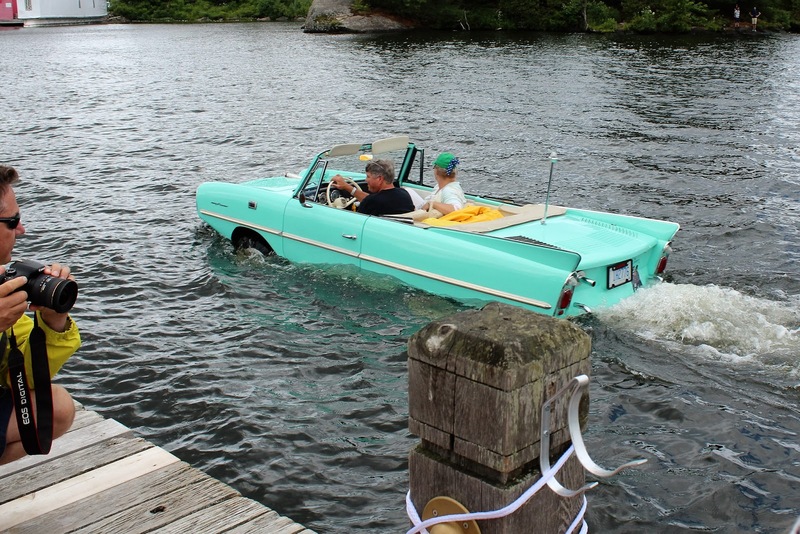 A much-loved curiosity, the Amphicar was built in Germany by the Quandt Group (the same family that controls BMW!) 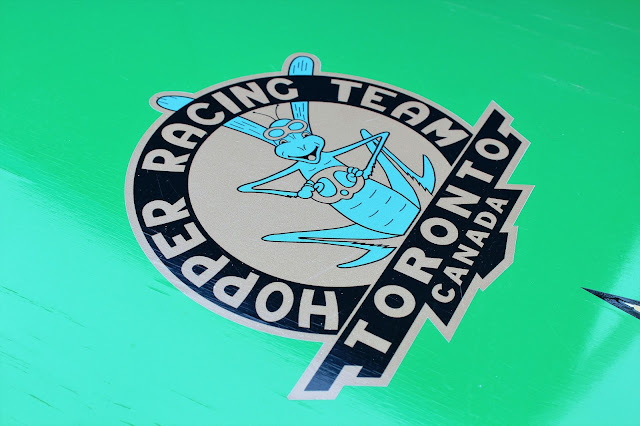 from 1961-1967. 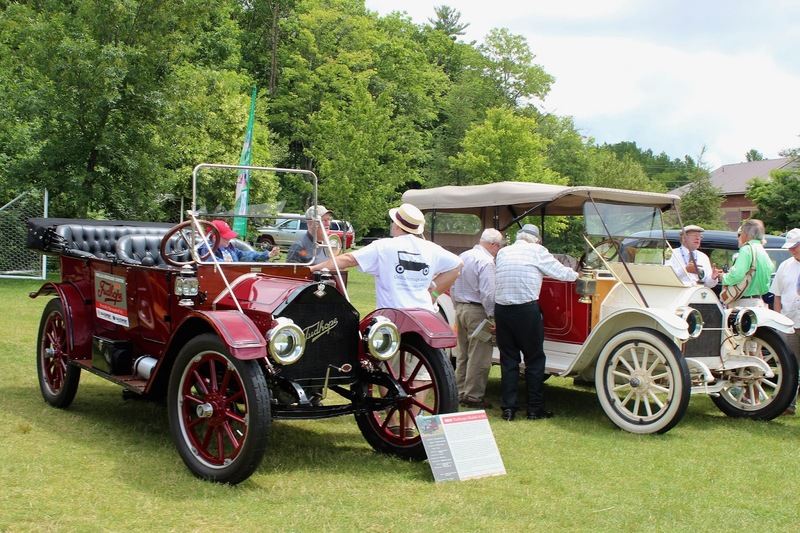 When production ended, 3,878 of the vehicle had been produced, most of which had been sold in the United States. 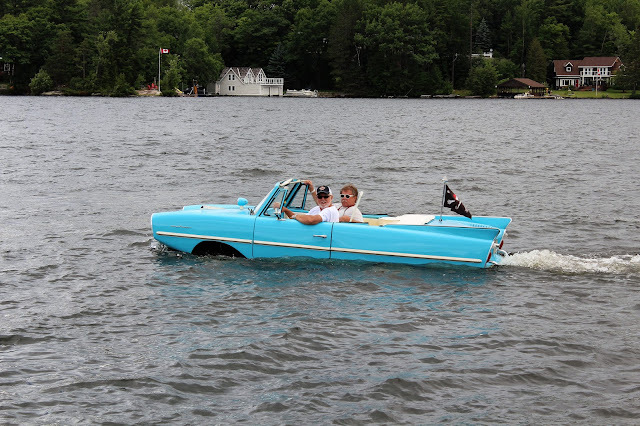 Lyndon Johnson enjoyed scaring guests with his, pretending to lose control and then driving into the lake at his LBJ Ranch. 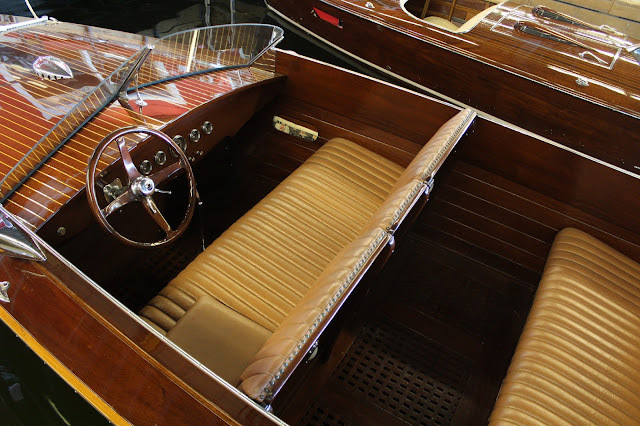 A car of very limited performance with its Triumph Herald engine of 43 bhp, it was not a very good boat either as it was steered in the water with its front wheels so it was not very maneuverable compared to a real boat. 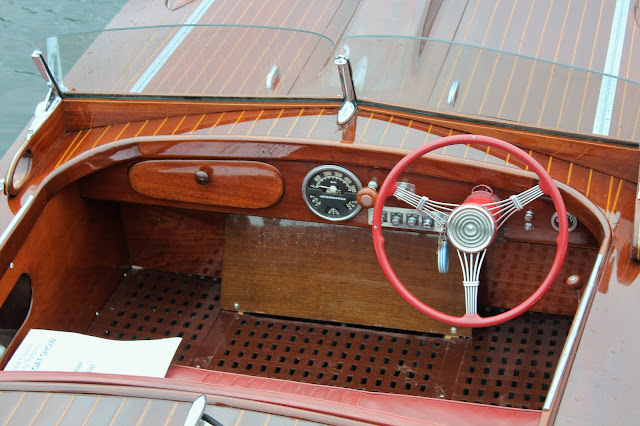 It has a two-lever gearbox, one lever being used to engage the twin propellers at the rear of the car in the water. 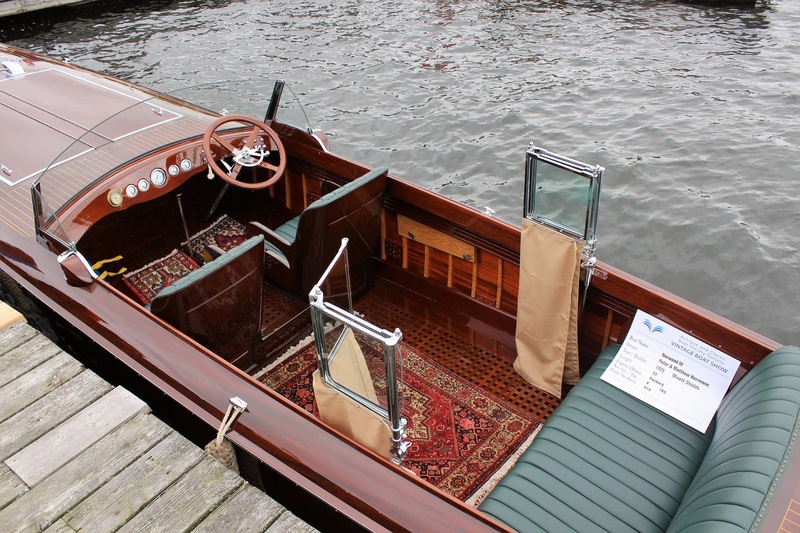 The doors locked shut for water travel. 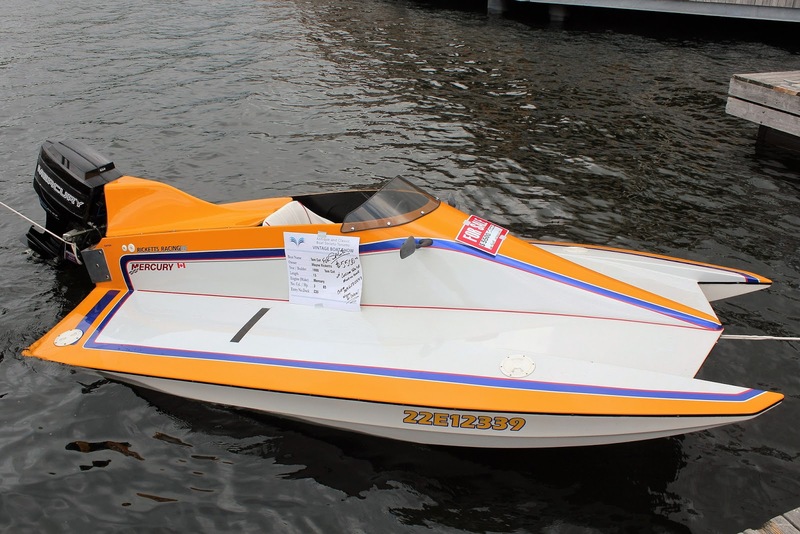 The average price of one of these oddities is currently around US$ 68,000. 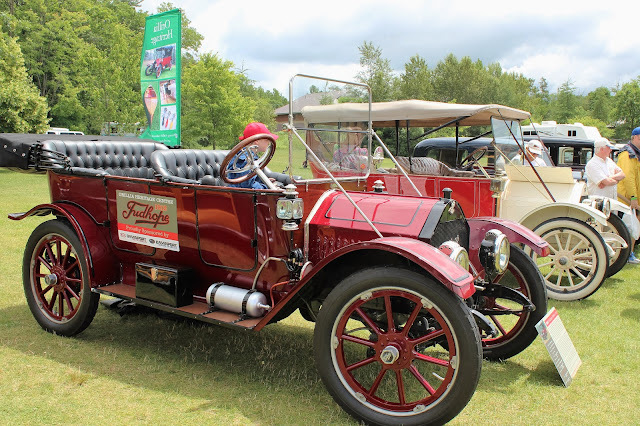 1912 Tudhope 4-36, built in Orillia, Ontario, and one of only 2 surviving cars from that year's production. It was built under a production license from the former principals of the E-M-F Company, which itself had been taken over by Studebaker in 1909. 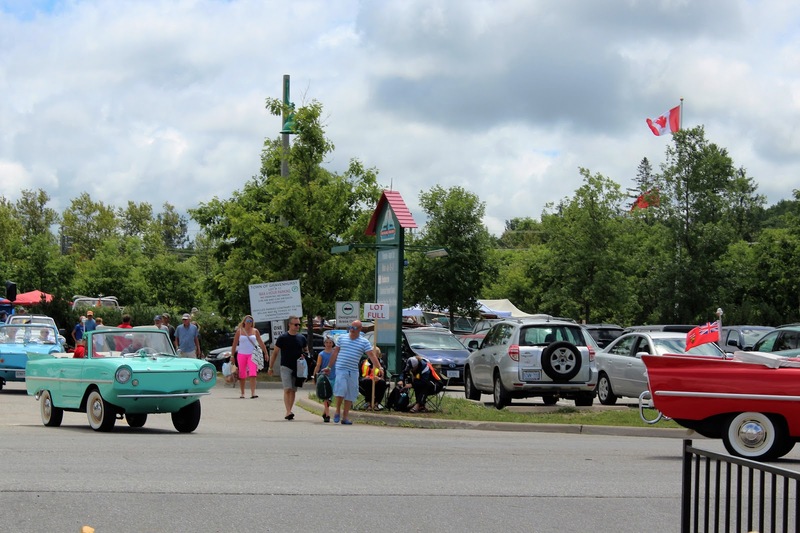 The car is on display during the winter months at the Orillia City Hall. 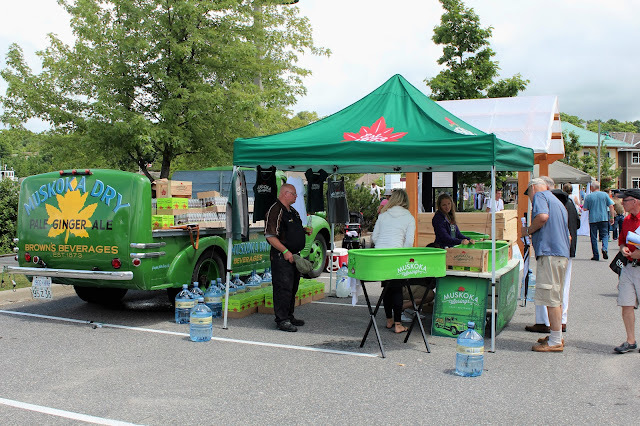 Founded in 1873, the Muskoka Springs Natural Spring Water, Inc., is probably the oldest continually-operating business in the Muskoka region--and has been at the same location the entire time! 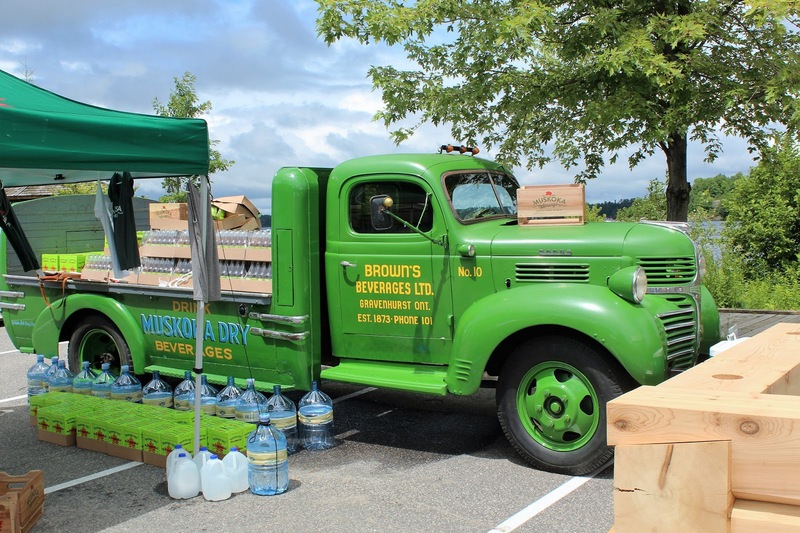 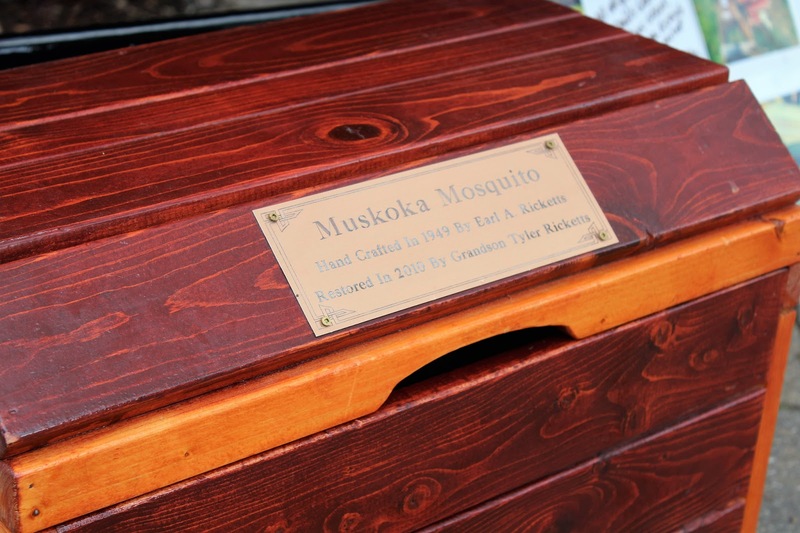 In 1941, it purchased at Dodge pickup truck for deliveries and continues to use the truck to promote its Muskoka Dry brand.